There are some things you can't imagine ever needing to say and "we're not going to be eaten by wolves" is a phrase I certainly never imagined myself saying. That said, I did have to tell my sister and various people we work with that we weren't going to be eaten by bears while camping. Daz and I are both flappers. We don't seem to get stressed about the same things at the same time, which is great because while I'm convinced we're gonna die in a kayaking accident 10 feet from the shore, he's says "no we're not, I got this." Which is great because I believe him over the voices in my head that try to tell me everything is dangerous. Last August, we were booking campsites for our trip and we really wanted to stay at Two Jack Lakeside. We'd looked at all the other Parks Canada sites in the Banff area and Two Jack was easily the most beautiful and quietest looking. We tried to book and were halted by a message saying that due to a "wolf problem" the site wasn't accepting bookings at that time. We soon discovered that some idiots had left food out at the site, which had attracted wolves. It doesn't take a genius to figure out that if you provide a wild animal with a really easy source of food, they'll come back to find it again. Not only does that cause them problems by making them dependent on humans, but I think you'll agree a tent is probably next to useless in protecting you against a hungry wolf. You may as well wear Lady Gaga's meat dress and offer yourself to them. On a more serious note, a wolf had to be destroyed because of someone's thoughtless actions. The campsite re-opened and that was where we ended up staying for the last couple of nights of our trip. It totally surpassed our expectations and we're going back there again this summer, so it is definitely worth a visit if you're planning to stay in the Banff area. It had been cloudy our entire trip and on the last night we finally had some clear sky, so I wanted to try a bit of nighttime photography. 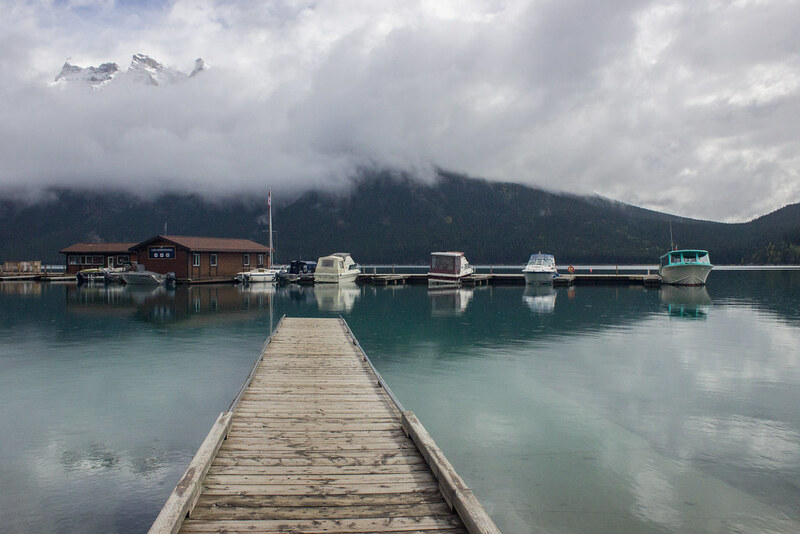 We drove to a little jetty (if that's what you call it) at Lake Minnewanka and I started faffing about with my camera. This time, it was Daz's turn to stress. It was pretty much pitch black and we were the only people about. We'd been told to be vigilant for wolves (we didn't see any), had seen signs up about wolf sightings on trails in the area, and for some reason I'd seen fit to park at almost the furthest point away on the car park, which was surrounded by forest. This is how horror movies start. It's one of those situations you look back on and wonder what on earth you were thinking. Especially given childhood nightmares about being eaten by a black demon dog / wolf. If I ever see a horror film again, I won't ask "what were they thinking?!" because I now understand that they were probably just trying to take some awesome nighttime shots. Clearly, we did not get eaten by wolves, which I guess is pretty anti-climatic if you were expecting my title to be famous last words. 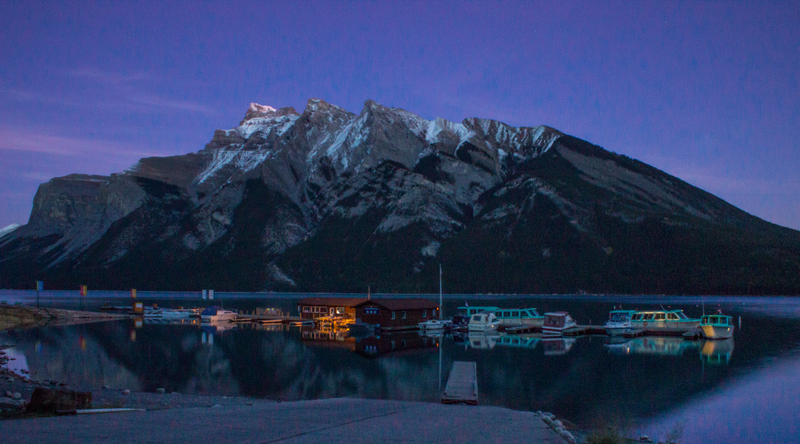 I can't look at these photos of Lake Minnewanka without laughing to myself about the wolf incident.